Yay! It’s day 7 of Blogmas and I’m still here! Considering I only decided to do Blogmas on November 30th I’d say I’m doing pretty well. For today’s post I thought it would be nice to talk about one of my new favourite tabletop games. 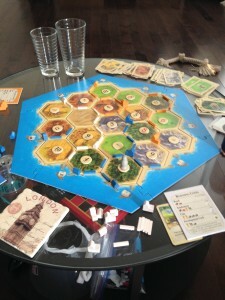 Many of you may have heard of Settlers of Catan before. It has become quite a popular game over the past few years. It’s a very fun game that seems complicated at first, but after getting through your first game it is actually quite easy. It’s basically a game of trading resources and building roads and settlements. The game is won by the person that gets 10 victory points first. These can be won in a number of ways. Some ways to get victory points include building settlements, having the largest army, or having the longest road. I really enjoyed this game because its so well rounded. You never really know how far ahead someone is until the end of the game. It is also easy for someone who is lagging behind to jump into first. It also is very family friendly and doesn’t result in everyone hating each other in the end (like Monopoly). If you’re looking for a new board game to play and don’t mind taking a bit of time to learn the rules, I’d definitely suggest checking out Settlers of Catan. And just as an aside, I’ve been loving doing blogmas, however the posts may stop for a little bit (don’t worry they’re all planned out and will go out eventually). I’ve just been very sick lately so if a post doesn’t make it out on time it just means I haven’t been well enough to perfect it. Hopefully that doesn’t happen, but if it does I’m very sorry and the post will make its way up on the site in the near future. This entry was posted in Games, Tabletop and tagged Blogmas 2015, settlers of catan, tabletop games by Sarah. Bookmark the permalink.